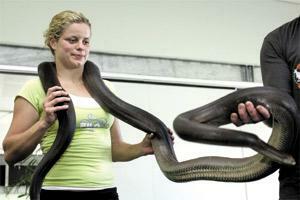 Kim Clijsters holds an olive python in Sydney yesterday. Kim Clijsters survived a ferocious fightback from China's Li Na yesterday to book her place in the Sydney International final against in-form Serb Jelena Jankovic. Third seed Clijsters had to draw on all her big-match experience and reserves of energy in the scorching heat to record a 6-1 1-6 7-5 victory, joining Jankovic in today's final. Jankovic produced an inspired performance in beating Nicole Vaidisova of the Czech Republic 6-4 4-6 6-4 to reach her second final in a week, despite struggling with lower back pain for most of her match against the eighth seed. "I don't like to give up. It doesn't matter which tournament we are at," Jankovic said. "I try always to give my best and to fight until the end and today I had a problem with my back but the trainer came out and she really helped me a lot." Clijsters, who won the Sydney title in 2003, looked to be cruising to an easy victory when she raced through the opening set in 28 minutes before Li staged her fightback. Li ran the Belgian ragged in the second set with her booming forehand before Clijsters regained her composure after a 10-minute heat break to wear down her opponent in the decider.